If you have any interesting memories or family stories of wartime Coventry or the Blitz please email them to me and I shall be happy to add them to my site. Any wartime snapshots would also be much appreciated. Mr R Shuttleworth relating his wife’s memories of the Blitz. My wife, who lived in the City during these times, spoke of the rumour about many dead in a large shelter near Broadgate. This arose because of a terrible smell of rotting flesh which occurred during the clear-up. It was eventually traced to meat in a large underground cold-store. There was another rumour at the time, that the noticeable slackening of anti-aircraft fire during the latter part of the attack was due to some perverse order from London. Shortly after the event, my father-in-law gave a lift to one of the gunners who said that they had been unable to keep going because they were so exhausted after several hours of continuous firing, that they no longer had the strength to push the shells up into the breeches of their guns. My Uncle Oliver Twamley and Aunt Nellie lived at 84, Little Park Street. This was originally the house of my Brookes grandparents Lewis and Jane, with their children. Oliver was employed by Rootes Securities Ltd.
On the 15th November 1940 Oliver was sheltering with his family in an air raid shelter located in one of the courts off Little Park Street. When all had been quiet for a while Oliver said he was going back to the house to put the kettle on He set out with his brother in law John Taylor. As they were walking, another bomb fell and Oliver was caught in the blast. This killed him but left no visible mark. My Aunt Nellie was neighbour to my mother's cousin Lilly Daly, and Lilly’s sister-in-law Jane Daly lived in Grosvenor Road. On 10th April 1941 Nellie decided to visit this elderly lady to see how she was keeping as she was confined to her bed. When the raid started she decided to stay and comfort the old lady rather than risk trying to get home. As she was unable to leave her bed Nellie shielded her as best she could by lying across her. Unfortunately the house received a direct hit and the roof collapsed upon them killing them both. They were found six days later. Also killed in Grosvenor Road were Ethel Lucy Loveitt and her sister Janet Mabel both daughters of Thomas and Mary Rolfe Loveitt. They were listed as visiting a sick parishoner; this could have been Jane Maria Lapworth Daly as I know there was some connection. 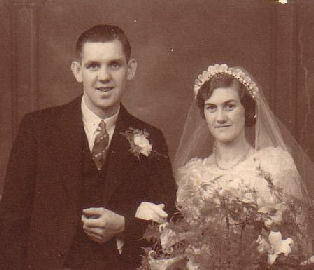 Also killed by the Germans was Lily Daly’s husband, brother of Jane who was in the Highlands Nursing Home at the time. Tom was born in 1914 at Coventry. He was married to Phyllis Watson. They resided at 104 Arbury Avenue. Tom was killed in the April Raids 08/04/1941 at the Alvis Works Shelter, Holyhead Road Aged 26. He was buried in the Communal Grave at London Road Cemetery, Coventry. George and Louisa Cooke were my Grandparents. I was not born until 1942 so I never knew them personally. I understand that their shop in Coventry City centre was bombed, and they went down into their cellar to shelter. The cellar was flooded because of broken water mains. However, they sheltered in the cellar as best they could. Unfortunately the mains electric meters and wiring were also in the cellar, and George and Louisa were electrocuted. The	story archive continues with K Hill's memories of the bombings, and the discovery of an illegal firearm captured from a German officer by her father.